We are on sensory overload tonight. We’ve had such a great day. 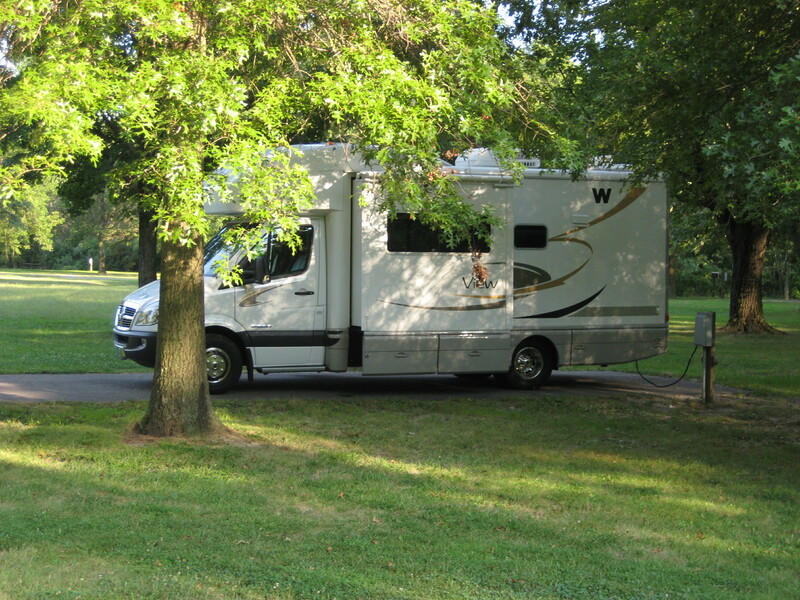 Left Sioux Falls, SD this morning around 8:00 a.m. We had breakfast, took a nice walk around the campground, and then left. We slept well last night. 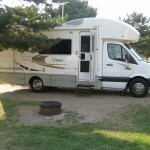 Just about sunset, another Winnebago View pulled into a site near us. There are very few of our models on the road, so when we see each other, we are excited. These folks sold their 41 foot diesel pusher for the 25 foot diesel View. 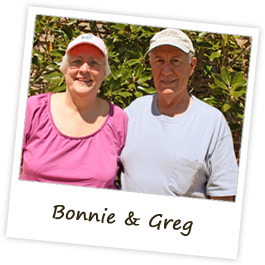 He and wife are very happy with their downsizing because the View is so easy to maneuver. We did a rough figuring of gas mileage, and we are getting around 15 mpg. Diesel fuel is averaging about $4.10/gallon. Still spending about $100/day on fuel, but whatever….. 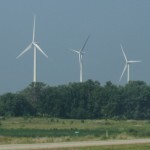 The wind was blowing strongly during the morning hours. 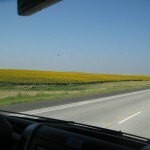 The cornfields and soybean fields have given way to rolling hills of grain and sunflowers are far as the eye can see. 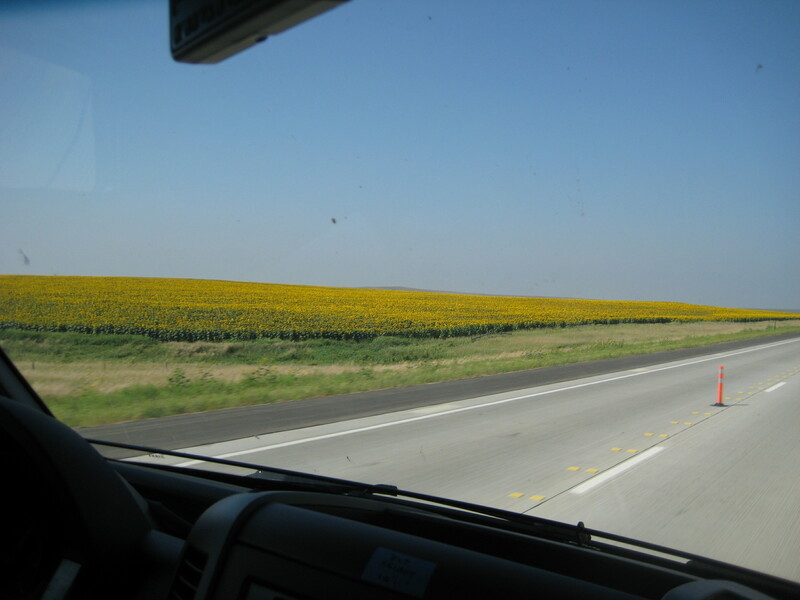 Fields of sunflowers were Just a beautiful site. 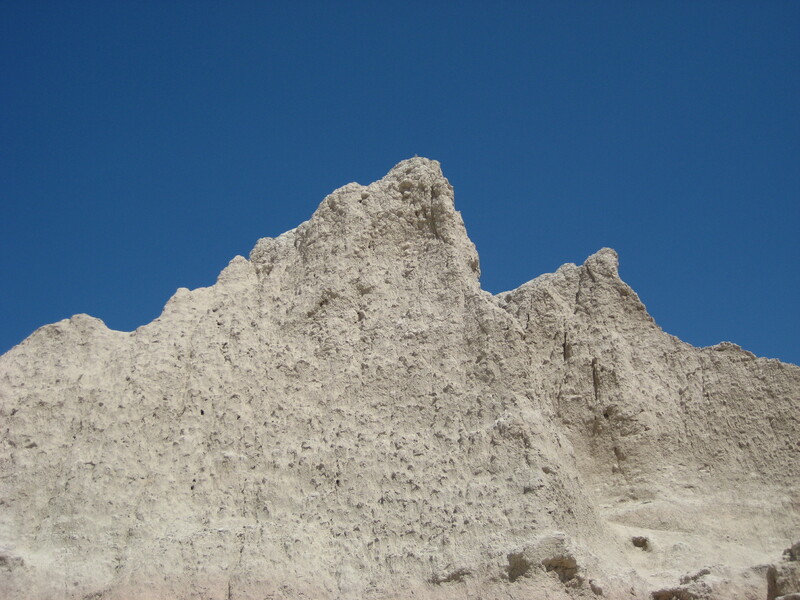 We still have not had a drop of rain—just blue skies and clear. 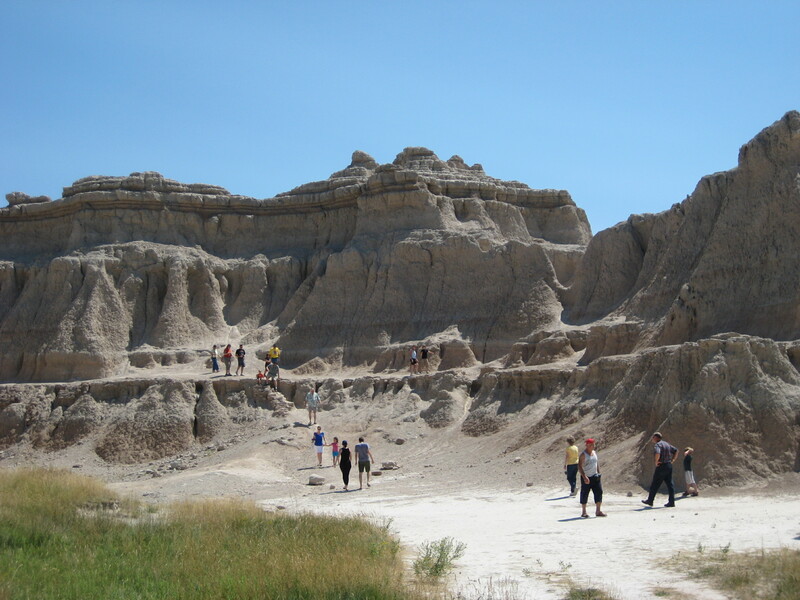 Did you know that the city of Pierre, South Dakota is not pronounced like a french name? Up here, they say Pier, as in Pier 1 Exports. Another thing we’ve learned on this trip—being on a tight schedule is NOT something we will ever do again. We are having to move faster than we would like due to reservations in Yellowstone. We would have stopped more frequently had we not been pushed for time. But we’ve stopped plenty…. we stopped at a rest stop for lunch today, and a gentleman pulled up near us in a pickup truck filled with beautiful cantalopes fresh from his garden. I walked toward him and asked if he was selling them and he said sure he would. 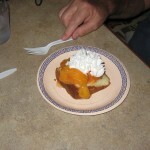 So we bought 2 fresh cantalopes, came into the RV and had a sandwich with wonderful sweet cantalope. We also caught a glimpse of a field of buffalo but I’m sure we will see more of them soon. And what’s a trip to South Dakota without stopping at Wall Drugs in Wall, SD? This place is a scream and a must see on a trip out here. Didn’t even buy a souvenir!!! But they are famous for serving “free” cups of water. 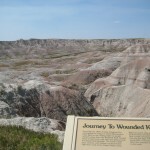 We drove through the Badlands and the scenery was spectacular. 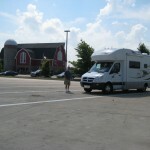 The temperature, however, was not, as it was 103 degrees when we got out of the RV. Whew! Didn’t stay out long. 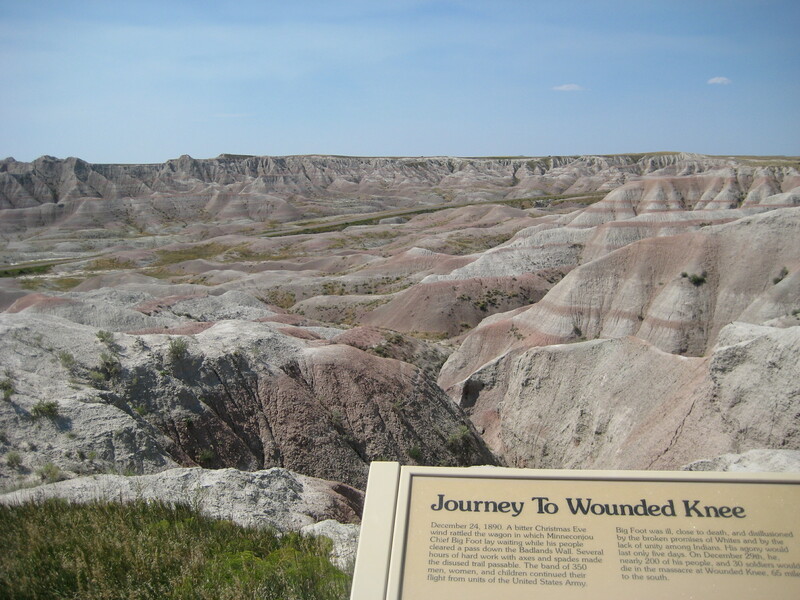 Then on to the Black Hills where we will visit Mount Rushmore tomorrow morning, as well as the Crazy Horse Memorial. 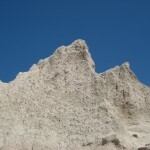 You are all familiar with Mt. Rushmore, but if you are not familiar with the Crazy Horse memorial, read about it on the internet. The story is quite interesting and I know we will be impressed when we see it. We are camping in a beautiful campground tonight in the Black Hills, about 5 miles from Crazy Horse. We are nestled under the tall pines native to this area. OK for those of you howling about my “gourmet” meals—tonight due to stopping late in the day, we had a bowl of lentil soup for dinner! We will cross into Wyoming tomorrow, and on to Cody, Wyoming on Saturday. Again, thanks to all of you who are commenting. We are so happy that you are enjoying our journey with us. Stay tuned. ok, now where was I? Oh yes, we stopped for the day at 4:00 p.m. That’s a good time for us to stop. Gives us time to “set up”, get dinner ready, and relax by walking and enjoying the end of the day. Tonight’s dinner was chicken nuggets, mac and cheese, and green beans. 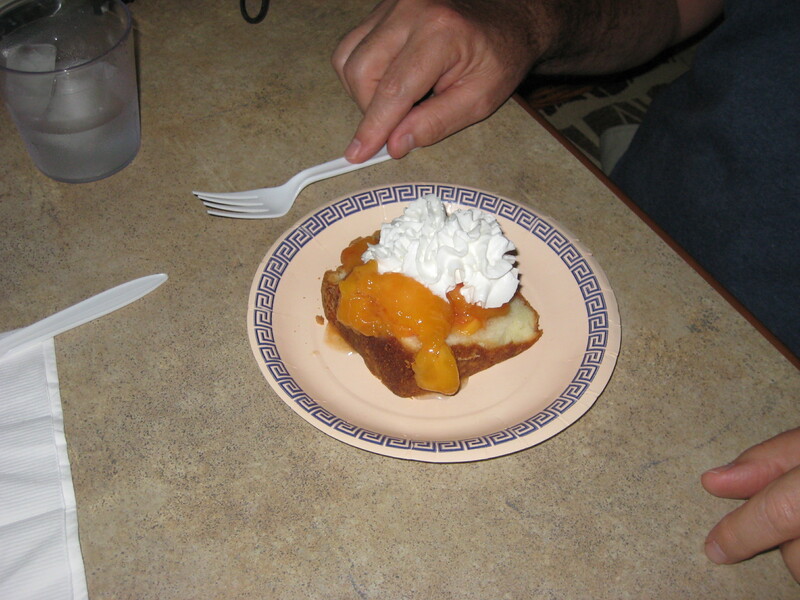 And I treated Greg to a good homemade dessert—homemade sour cream pound cake, fresh peaches, and whipped cream. Yum Yum, a good dessert for the end of a great day. 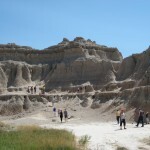 Tomorrow we are off to Mount Rushmore by way of Wall Drugs in Wall, SD. We’ll stop and take some photos to show you. 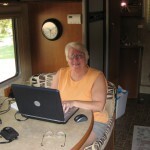 Thanks so much to all of you for commenting on the web site. This was set up by our younger son, Ben, for us for Mother’s Day. Thanks again, Ben! We are enjoying the comments so much, and appreciate your taking the time to join us on this trip. We hope this is the first of many. 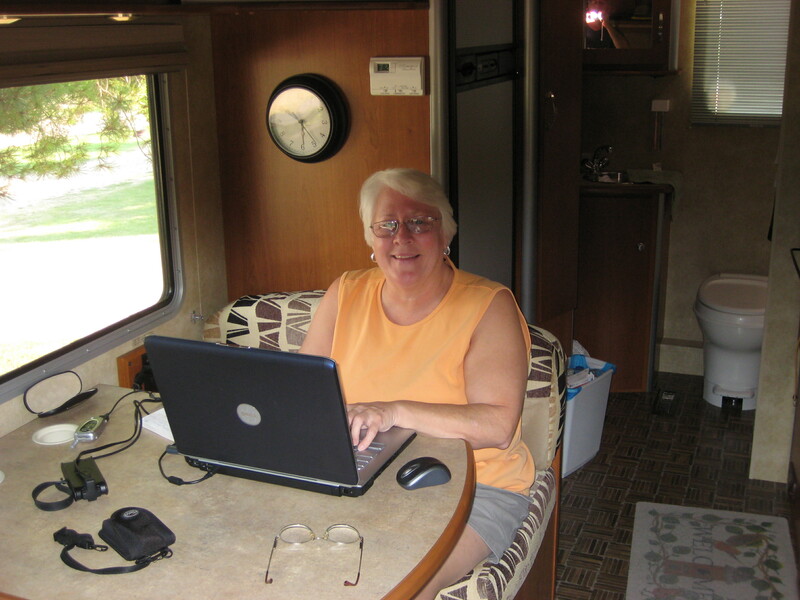 And a note about our Winnebago View: We are so pleased with every aspect of it. It just chugs along without any problem. It’s well built, and has everything we need. Best of all, it’s a delight to drive–I share the driving every day and we don’t have a bit of a problem with anything. We just LOVE the View!!! And the newly installed levelers are working great! Makes set up extremely simple. This morning we awoke (I use that term loosely because we actually did not sleep much last night) at 5:30 a.m. for our 7:00 a.m. appointment. Sounds funny, because we only had to drive to the other side of the building, but by the time we dressed, had breakfast, put away everything, locked it down, unplugged, brought slider in, it was 6:30 a.m. We were ready ahead of time, but that’s the Trotter way, right kids? By 4:00 p.m. we drove away with our new levelers installed by the nicest guy ever. He had on a Sturgis t-shirt, his doo-rag, and his motorcycle was in the parking lot. He is my age, a Viet Nam veteran, nicest guy ever. He got a kick out of the moon pies we brought and said he ate at least four of them today. The levelers are so cool. The control panel is only the size of a 3 x 5 index card on the wall. 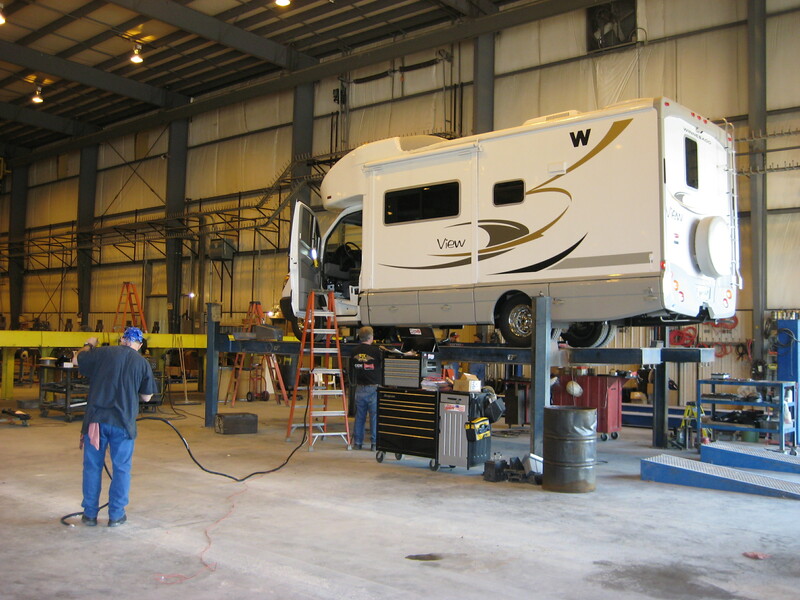 You just press a button, and all four sides of the RV are checked and leveled in no time. We were so tired when we drove away, we decided to spend the night in a hotel (holiday inn express) in Iowa City, Iowa. I was not prepared to cook dinner, there was no campground anywhere near us and we just didn’t want to drive on. Just so happens the hotel is right next door to an Olive Garden, so we treated ourselves to a nice dinner. 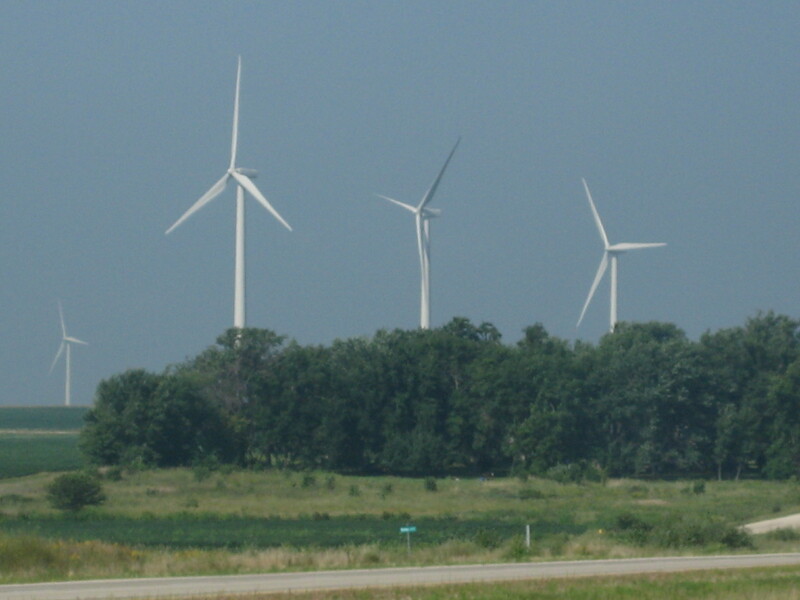 We’ll get a good night’s sleep and tomorrow morning we will streak across Iowa. After a great night’s sleep and cereal for breakfast, we left the park around 8:00 a.m. One thing we’ve learned quickly is that we cannot move our little home as fast as if we are in a car. There is much to do to get ready to leave. Make sure all the cabinets are closed and locked so that nothing will fly around the cabin as we drive. Unplug the electrical outlet; make sure all the outside compartments are locked down. Then we have to stop at the “dump station” to either dump the tanks or add water to the water holding tank. Then we have to get gas before we start the trip. We are driving about 60 miles an hour, so it takes longer to drive. The roads in Illinois today were terrible. Wonder what they are using their gas taxes for—certainly not for road improvements. We bumped around all day long. Stopped at a nice rest stop for lunch and decided to get outside for some fresh air. I made sandwiches and we found a nice little table under a shelter. The temperature is around mid-80’s, with mild humidity, so we are really enjoying the weather. 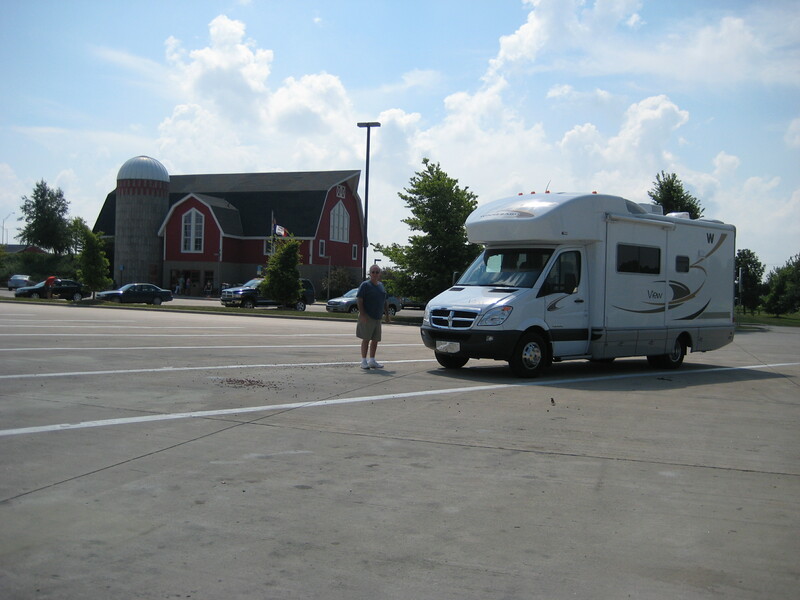 We arrived in Moscow Iowa around 5:00 p.m. We parked in the lot of the HWH factory where they have electrical hookups for folks like us who have early appointments the next day. We are tired tonight—luckily I had prepared taco meat ahead of time, so I just heated it up and made each of us a nice taco salad. Greg bets we have the best food of anyone around us. We are VERY prepared!!!! Allan, we thought of you tonight. We are parked right behind this huge propane tank. 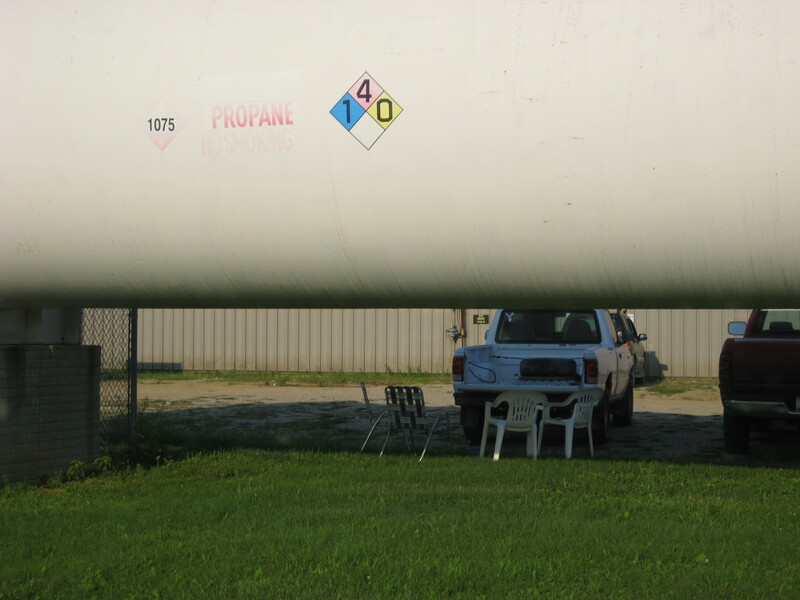 Under the tank were some folding chairs; we hope the workers don’t sit out there under the propane tank and smoke!!! LOL We probably won’t sleep a wink. Even though we only have to drive over to the other side of the building by 7:00 a.m. tomorrow, we will get up at 5:30 a.m. so as to have enough time to get ready, have breakfast, and get everything locked down before they start work. 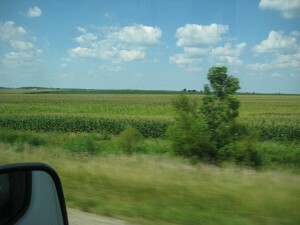 The scenery today was corn fields and soybean fields. 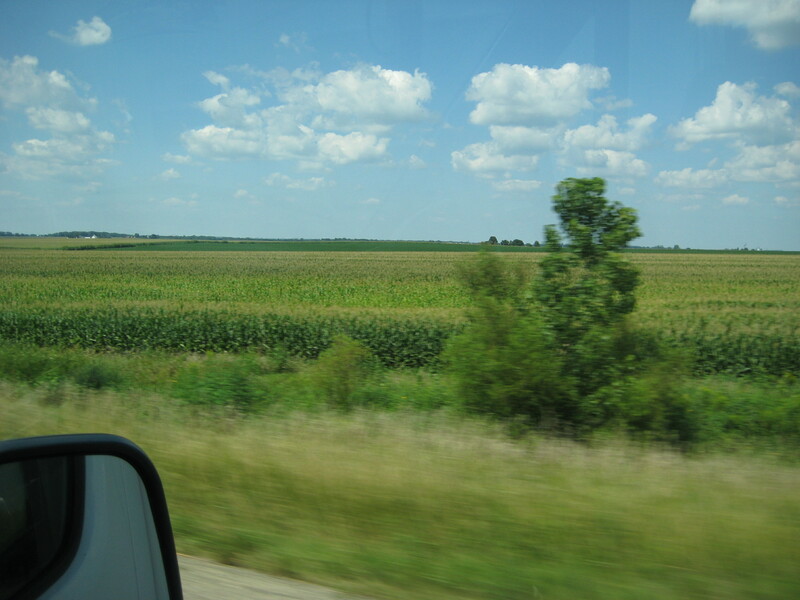 Illinois is big on growing these crops for ethanol. 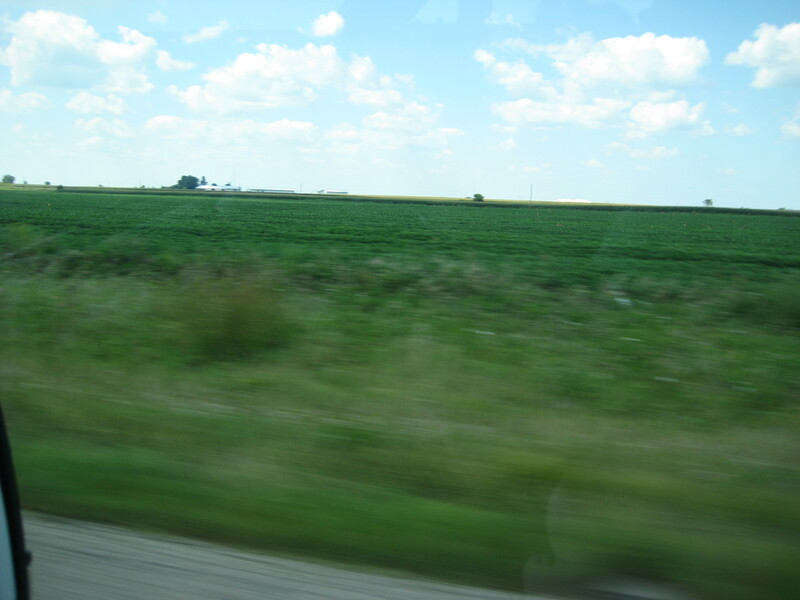 Every square inch of land is covered with both of these crops. Photos are of the fields and the propane tank. After much fanfare, we left home around 9:00 a.m. with high hopes. We’ve waited a long time to start this trip and we are excited to finally be on the road. Our neighbors all wished us well and were happy for us. 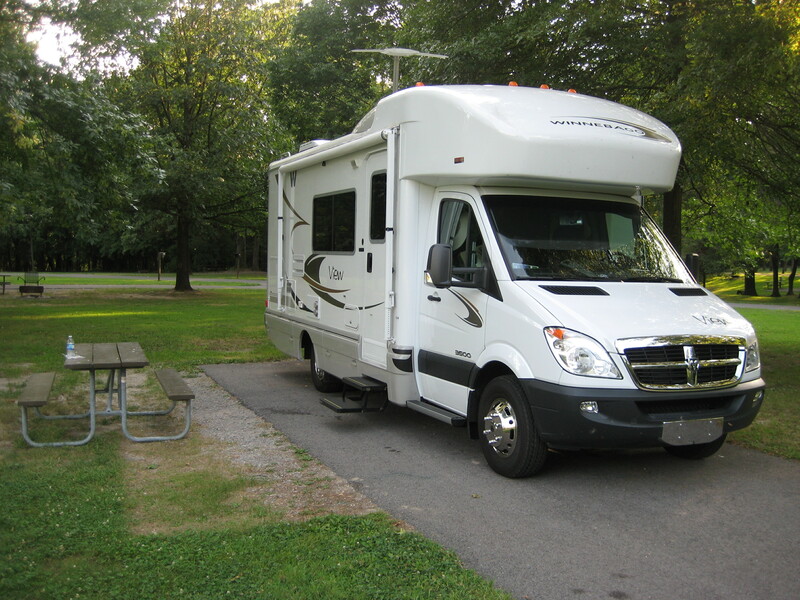 We had a great day of driving and reached our first evening’s stay which was Wayne Fitzgerald State Park in southern Illinois. What a beautiful little park!! There was hardly anyone camping there, so we had our choice of spots. 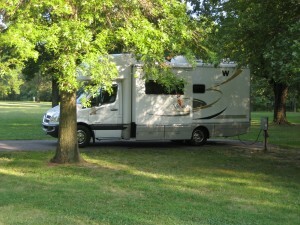 We checked in with the campground hosts, a nice couple from Arizona. They immediately wanted to take a look at our new Rig, so we showed them around. 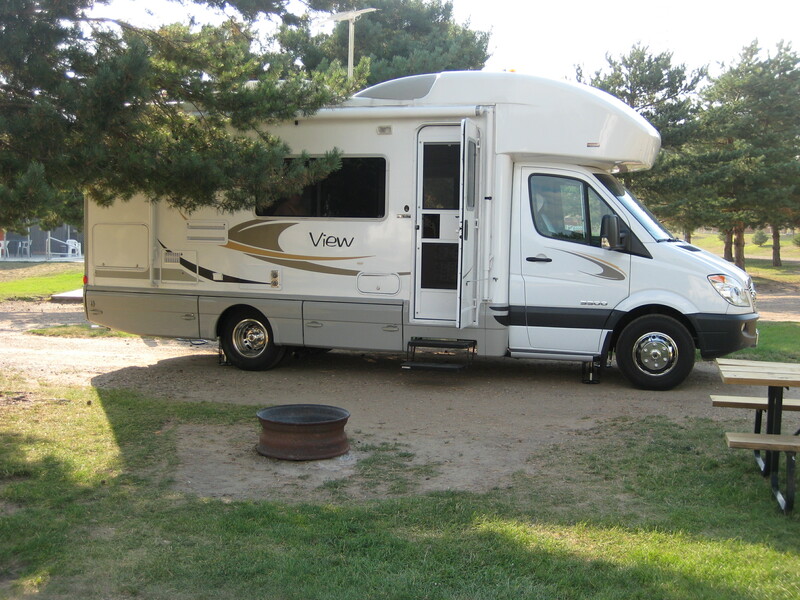 They had a “fifth wheel” and they were really impressed with our little Winnebago View. A raccoon passed right in front of us while we were getting set up; guess we are really in the wilderness. Our rig ran beautifully all day—it’s easy to drive and we are pleased with it. We’ve stopped twice to get fuel—the cost for diesel today was $4.09 per gallon and $4.29 per gallon at each stop. Our dinner this evening was honey baked ham and potato salad. We were tired and slept well—very pleased with our first day on the road.